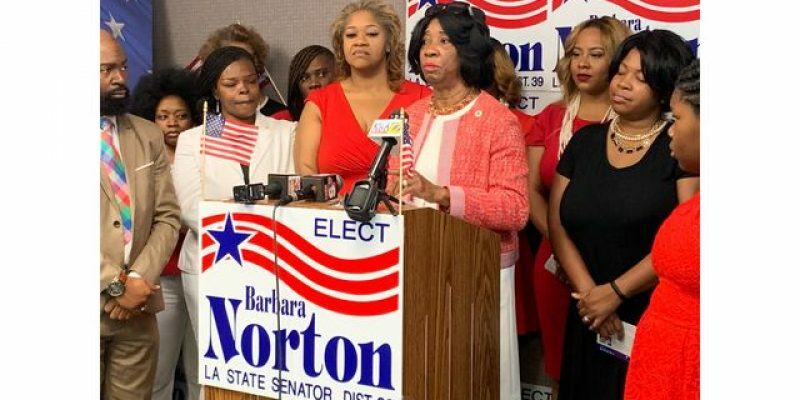 (Shreveport, Louisiana) – Louisiana State Rep. Barbara Norton (D) made her State Senate candidacy official at a campaign kick-off event on Thursday morning. Norton will face political heavyweight and two-term Senator Greg Tarver (D) for the seat that he has held since 2011. Rep. Norton, who is term-limited after serving in the State House for three terms, promised to fight for better paying jobs, better healthcare, and pay raises for teachers. The two found themselves on the same side of last year’s race for Mayor of Shreveport as they both effectively threw their support behind Mayor Tyler. Norton did so by vocally supporting Mayor Tyler for re-election and Tarver by vocally opposing then-candidate Adrian Perkins after a public falling out between the two. Rep. Norton has become infamous in conservative circles for being prone to gaffes as an unapologetic liberal but a joint town hall meeting in 2017 with conservative Congressman Mike Johnson (R) proved that she can be civil. Senator Tarver’s may have improved his image among Shreveport conservatives with his response to 710 KEEL’s Robert & Erin’s question, “Would you support a Republican in the runoff?” Tarver replied that he would work with anyone that he thought had what it takes to improve the city. Sen. Tarver said he met with several of the mayoral hopefuls but no endorsement was made. The election will be held on October 12, 2019. Candidates may qualify until August 8th. If a runoff is needed, the second election will be held on November 19th.